Get rewarded with Rakuten Super Points™ (RSP) for every purchase. Earn 1% back on every purchase. Use points at checkout to instantly save on your order. Add at least NT$121 worth of items to your cart to get your discount. Not in Taiwan? Choose your country's store to see books available for purchase. Daniel Deronda, the culmination of George Eliots distinguished career, is a tale of two cultures which explores the themes of concealed heritage, bigotry, and marriages of convenience in a manner never done before or since. Like its predecessor Middlemarch, it is a long novel of perfectly structured complexity and impressive intellectual exposition, built upon a cast of characters so sharply and meticulously defined that the plot is propelled solely by the power of their presence. This is the novel that Henry James wanted to write, and even he could never match Eliots passion and linguistic effortlessness. The forward story in Daniel Deronda is that of Gwendolen Harleth, a coquettish, conceited, superficial girl -- in company she often affects a sophistication that is never quite convincing -- who could be called the heroine even though she lacks most heroic attributes. She is from an upper class family, but when misfortune strikes and she is faced with poverty, she consents to marry a man named Mallinger Grandcourt, heir to a large estate, rather than reduce herself to taking a job as a governess, and despite having received a warning from a mysterious lady about Grandcourts having fathered illegitimate children. 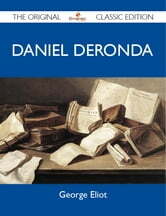 The secondary story is that of Daniel Deronda, the title character, a young man who first sees Gwendolen in a casino in Leubronn at the beginning of the novel. Daniel, who happens to be the ward of Mallinger Grandcourts uncle, Sir Hugo Mallinger, is inquisitive about his obscure parentage and unsure of his place in the world. One portentous day, he rescues a girl from drowning herself -- this is Mirah Lapidoth, a Jewish girl who has run away from her father in Prague and come to London to look for her long-lost mother and brother. Daniel decides to help her by playing detective, which eventually leads him to befriend a family of Jewish shopkeepers named Cohen, whom he supposes to be related to Mirah, and a deeply religious man named Mordecai. Eliot intertwines this Judaic element with that of Gwendolens unhappy marriage, as Daniel maintains a steady companionship with her while he spends time immersing himself in Jewish culture, learning about a past he never knew he had. The event by which Gwendolens situation resolves itself is foreshadowed by a particularly eerie symbol: In her familys house, there is a painting she dreads, apparently conceived by a morbid ancestor, depicting a figure running away in fright from an upturned dead face. As a plot device it may seem unrealistically gothic, but Eliots treatment of her material is too somber and mature ever to succumb to the absurd. This novel, while not as consistently great as Middlemarch, confirms my opinion that Eliot is the most accomplished, intelligent, and original of the Victorian novelists, boldly ahead of her time. She is undeniably one of the greatest psychological portraitists in literature; better than most other authors, she understands the way people think and why they do what they do, which is probably why her sense of tragedy feels authentic rather than merely sentimental. Whether Daniel Deronda is read to get a unique insight on Jewish life in London in the nineteenth century or just to bask in the opulence of Eliots prose, the effort will be richly rewarded.